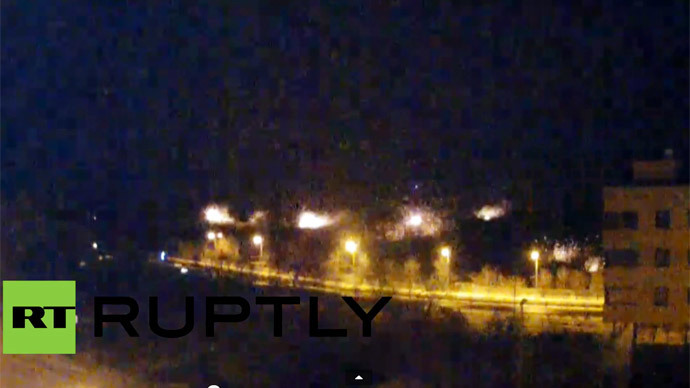 Blasts in the area of Donetsk airport illuminated the sky on Tuesday as heavy fighting between Ukraine’s army and local militia continued throughout the day. The situation has significantly deteriorated in the last 24 hours, according to the OSCE mission. “Currently active fighting is ongoing across the whole perimeter of Donetsk, gunfire is heard in all city districts, especially active [fighting] is in the airport,” the spokesman of the People’s Council of the Donetsk self-proclaimed republic, Andrey Purgin, told Rossiya 24. However, the airport has not been completely surrounded by local militia, he added, saying that Ukrainian military can evacuate. “Our military can allow this,” he stated, referring to the Donetsk People’s Republic (DNR) militia. “More civilian casualties have been reported elsewhere,” the statement on the OSCE website reads. The chief monitor of the OSCE Special Monitoring Mission to Ukraine, Ambassador Ertugrul Apakan, has called upon all sides to exercise maximum restraint and observe a ceasefire.